Last Saturday, I sat in the most packed cinema I’d been in since the last Harry Potter was released. The mammoth success of the first Hunger Games movie definitely hasn’t worn off, and I for one am so glad – if you see and love the movie you are more likely to read the book and that cannot be a bad thing. 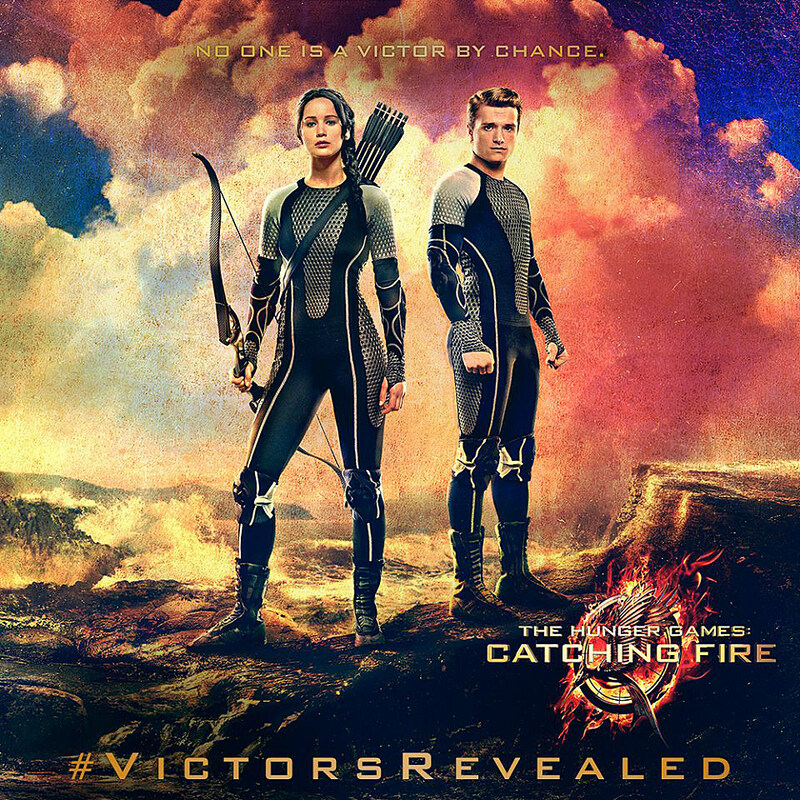 Catching Fire follows Katniss’s and Peeta’s life after their success in The Hunger Games, and the political and social complexities they now have to maneuver themselves through. The movie feels slow to start with, mainly because it’s reestablishing the relationship status between Katniss, Peeta and Gale, and establishing the societal tensions. However, once the action kicks in the slow start is soon forgotten, replaced by familiar violence that peppered the first book. The movie twists and turns, and although none are that unexpected (especially if you’ve read the books) it’s enjoyable and exciting to watch. The plot almost doesn’t matter. I say almost because although there is a simmering rebellion, a love triangle and a despot leader hellbent on killing Katniss, essentially Catching Fire is a copy of the first movie because out heroes find themselves again in The Hunger Games. Again, the stand out performance came from Jennifer Lawrence, who excelled in introducing a multifaceted aspect to Katniss’s character. Katniss is so strong and so weak in equal measure and Lawrence perfects this strength and vulnerability. I love the fact that her relationships with both Peeta and Gale don’t override everything else in her life. The other actors are strong too – Woody Harrelson providing some much needed moments of humor. The strength of the Hunger Games, as a franchise, is that it’s message is so radically different from other franchises. It asks us to look at our society, at our apparent obsession with reality TV – there is a real moral dilemma there and that’s why I am so glad that it is so popular. Catching Fire is well written, brilliantly acted and action packed. Its a great, engaging film that really sets up Mockingjay well. I loved the Hunger Games series, and this adaptation is pretty faithful. And the best part – you come away from it thinking about what The Hunger Games is saying about our society. I definitely recommend seeing it. Previous Post Top Ten Tuesday: The Top Ten Books I’d Recommend to A Kid Who Hates Books! Good review Laura. Worth the watch, especially if you want to see this story continue on and develop some more.